Sterling vineyards is perched atop a hill in the heart of Napa Valley. 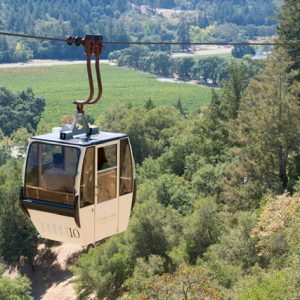 Both the winery and tasting rooms are only accessible by its aerial tram. This experience of floating above the vineyards are what have made this an iconic Napa Valley staple. It really feels like they have fined tuned the visit for every guest. They offer a handful of experiences that include a self guided tour and a variety of tastings. Each tour includes several stops where you can try wines and learn about the process. Both the staff and wines are amazing. The winery itself takes its design from the greek architecture of Mykonos. The white stucco facade and arched accents are a stark contrast to the greenery around it. Walking around the property will whisk you away with its mystical atmosphere. The highlight of the tour, though is the final stop. Tours end on an outdoor terrace with some of the best views of the valley. From here you can take amazing photos, sip delicious wine, and order small bites. While the whole visit is spectacular, the outdoor terrace alone, is what makes this a must do in Napa. PRO TIP: this place draws crowds and for good reason. That’s why we recommend coming here early or during the week. You’ll be able to avoid lines and enjoy a much more peaceful trip. Sterling Vineyards dates back to 1964. This is when oxford graduate and successful businessman Peter Newton opened its doors. Their wines date back to 1969 when they released their first varietals. This included the Napa’s first-ever vintage dated Merlot. Sterling’s wines are classic Bordeaux style varietals that will please any palette. Sterling’s wines are well regarded and are what helped put Napa on the map as a world class appellation.